The skin is the largest organ of elimination. Why block it with Soap and soap products? The constant use of soap causes premature aging of the skin. 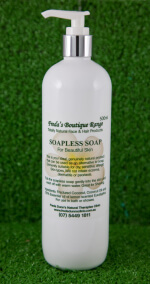 Soapless Soap was created for people who truly care about their skin and health. This is your ideal, genuinely natural product that can be used as an alternative to soap. Eminently suitable for allergic, sensitive skins. Leave one by each washbasin and shower and see how your skin blooms. Only a small amount is dispensed each time and that is usually sufficient, making it very economical for family use. Made from Fractured Coconut, Coconut Oil and 100% Essential Oil of Lemon Scented Eucalyptus.